I’m not sure what drew me to potato pizza initially. 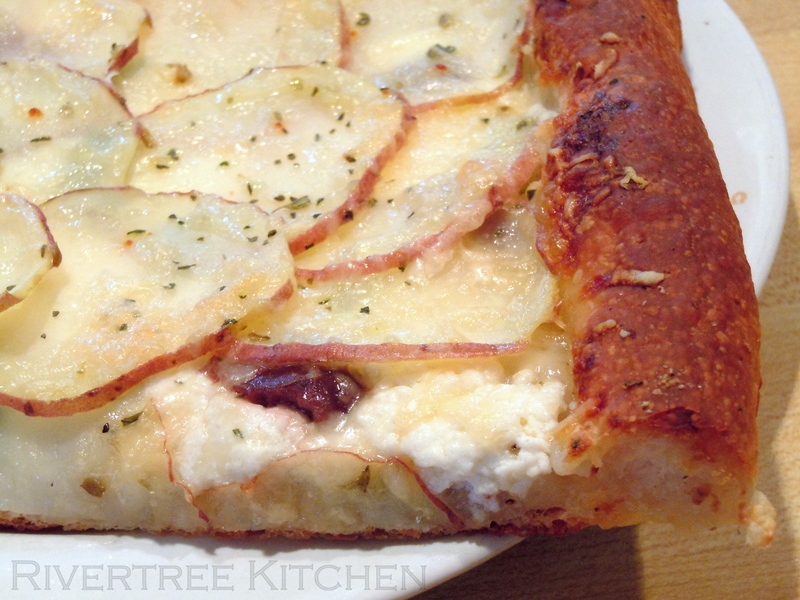 Perhaps it was the challenge of making two fairly bland ingredients — dough and potatoes — flavorful and appealing. In my first attempt, I spread a thin layer of (store-bought) ricotta over the dough, sprinkled it with some grated parmesan, and topped the cheeses with translucently thin slices of raw potatoes. A light brush with olive oil, a touch of salt and pepper, and in the oven it went. The potatoes were nicely browned in places, but overall the pizza was a bit bland and dry. For the next attempt, I followed the recommendations of a number of recipes and parboiled 1/8-inch-thick slices of taters. Don’t try this at home. Parboiling made the potatoes more moist but did nothing for the flavor, and with all that moisture, nothing browned. Waxy potatoes work best; they hold together and have a great texture when cooked. I’ve used both Red Bliss and Yukon gold potatoes with great results. What we needed here was a burst of flavor. I mixed some pesto in with the ricotta for some herby goodness and added the briny kick of a handful of pitted calamata olives. Now we’re onto something. Let’s take a brief break to discuss olives. This is not the time for those bland pseudo-olives that come in a can. We’re looking for seriously intense flavor here. Picholine, calamata, niçoise, or even ordinary green olives will have the kick you need. You can also just use tapenade, that fantastic olive-garlic spread. Luke and I love olives, but Tom hates them, so next time I tried using prosciutto instead for the salty hit. I layered the prosciutto on top before it went into the oven to get some crispy bits, but you could also put it under the taters, or just add it after the pizza comes out of the oven. Once again, I have to tout the virtues of homemade ricotta. The difference in texture and flavor is simply astounding, and it is neither time-consuming nor difficult to make. NOTE: This recipe was the runner-up in the Whole Foods Cooking Best Recipe with Potatoes contest in November 2011. Heat the oven to 475 degrees F. Line a cookie sheet with parchment and sprinkle with the cornmeal. (You don’t have to use the cornmeal, but it keeps the dough from sticking and adds great crunch to the crust.) Spread the dough out. The shape doesn’t matter, but the dough should be thin. In a small bowl, mix together the ricotta and pesto. Spread it in a thin layer all over the pizza. Sprinkle with half of the parmesan. Slice the potatoes translucently thin. A mandoline is the perfect tool for this, but you can slice them by hand also. I prefer to leave the skins on, but it’s not necessary. Lay the potato slices in one slightly overlapping layer over the cheese. Immediately drizzle with the olive oil. Season lightly with salt and a bit more heavily with pepper. Tear the prosciutto into pieces and drape over the potatoes (or sprinkle on the olives, if you’re using them instead). Sprinkle with the rest of the parmesan. Bake for 12 to 18 minutes until the crust is golden and the potatoes and prosciutto have some browned, crispy bits. My oven is not known for its amazing browning abilities, so I start the pizza on the bottom rack, then move it to the top rack halfway through the cooking. This entry was posted in appetizers, baked goods, main courses and tagged contest finalist, homemade ricotta, parmesan, pesto, pizza, potato, potatoes, ricotta. Bookmark the permalink. 2 Responses to Potato pizza — anything but bland. This looks great! 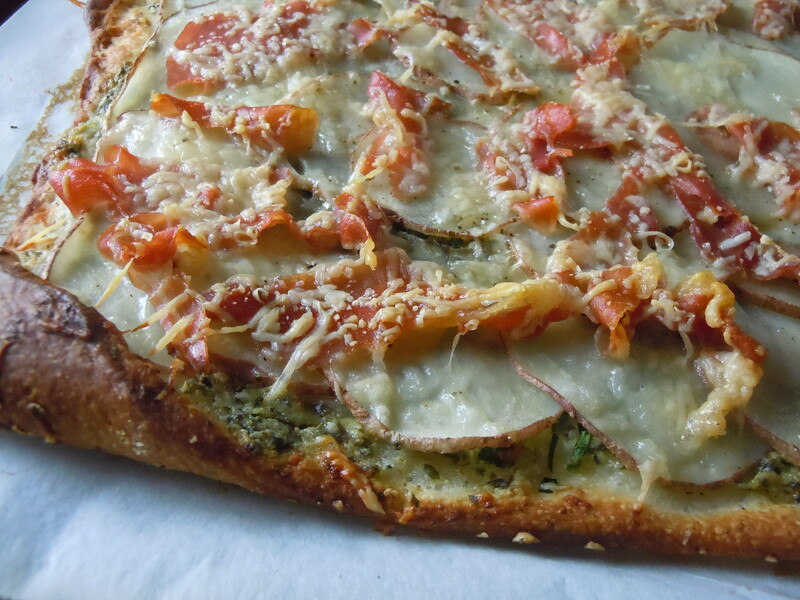 I love making homemade pizza, but never thought of using potatoes as a topping. I have a teenager, so we eat a lot of pizza. It is fun to expand beyond the tomato sauce and pepperoni–not that there’s anything wrong with that.